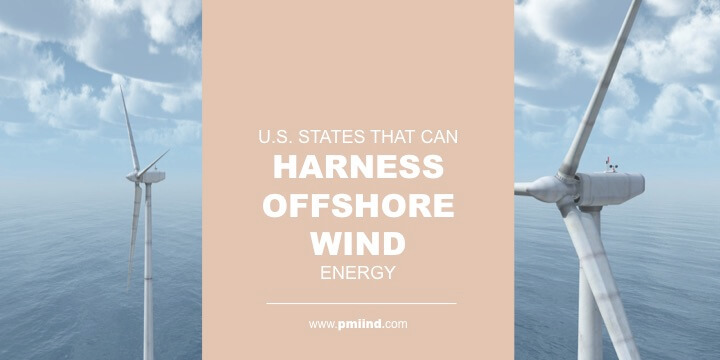 With more than 95,000 miles of shoreline, the United States looks like an ideal candidate for offshore wind energy development. But it’s not that simple. A substantial portion of U.S. shoreline tracks the Southern Atlantic states and the Gulf of Mexico, where the winds are either too weak most of the year or potentially catastrophic during hurricane season. The Pacific Coast has steady, powerful winds, but the continental shelf drops off sharply near the shore, requiring floating wind-power platforms that cost much more than fixed-position wind farms. “The market value of offshore wind between 2007-2016 varies significantly by project location and is highest for sites off of New York, Connecticut, Rhode Island, and Massachusetts,” the study found. Massachusetts. With the doomed Cape Wind project finally out of the picture, the prospects for other offshore power projects are improving. The state government has passed legislation targeting 1,600 MW of offshore wind power by June 30, 2027. The law requires a buffer of 10 miles between offshore wind farms and inhabited areas to avoid angering the public, which prizes its coastal views. Three companies are bidding for projects off Martha’s Vineyard. Maryland. Two companies have been awarded renewable energy credits to develop wind farms of 120 MW and 248 MW. The credits are worth $3.6 billion over two decades. Developers are required to create nearly 5,000 jobs and invest in a steel fabrication plant and port upgrades. The project will involve 77 turbines from 12 to 21 miles offshore. New York. Gov. Andrew Cuomo would like to see 2,400 MW of offshore wind power developed in the next two decades. He wants to start with 800 MW in 2018-19. New Jersey. The state’s Offshore Wind Economic Development Act, passed in 2010, sets a goal of 3,500 MW of new power generation by 2030. The state’s Board of Public Utilities plans to solicit 1,100 MW of new projects, which would be the nation’s largest so far. States and projects further down the coastline in Georgia and the Carolinas appear much less likely to bear fruit, the POWER magazine article explained. The Pacific Coast and the Hawaiian Islands each present intriguing opportunities because their terrain limitations require innovations in floating offshore platforms. Unlike Europe’s North Sea and the Eastern Seaboard of the United States, the shoreline of the Pacific plunges to depths that are impractical for the development of standard offshore wind turbines mounted on the seafloor. In May 2018, the U.S. Navy complicated matters even further, stating that vast swaths of California coastline — including all of Southern California — should be off-limits to wind farms because the Navy needs that space for national defense purposes, the Los Angeles Times reported. The Navy cannot decide where wind farms will be deployed, but it has considerable influence. Perhaps the best news for the Pacific comes from the coast of Scotland, where the first floating platform offshore wind farm is up and running. That wind farm is proving to be remarkably energy efficient, using up to 65% of its capacity factor, which is far better than land-based gas and coal power, according to Greentech Media. Capacity factor estimates a powerplant’s output as a percentage of its theoretical full energy output. With the cost of developing offshore wind farms falling rapidly and floating platforms showing promise, power from the Pacific might be closer to reality than many observers suspect. A wind farm project in the works near our home base in Cleveland will test the viability of the Great Lakes, which have ample wind, high population densities, and relatively shallow water. The Icebreaker project plans to deploy six turbines in Lake Erie about 8-10 miles northwest of Cleveland. Supporters hope this pilot project becomes a catalyst for further development throughout the Great Lakes. Many coastal states have ambitious renewable-energy goals that will require the development offshore wind because there’s only so much they can do with solar, land-based wind, and biofuels. Fortunately, they can benefit from decades of European experience in offshore wind combined with steep declines in development costs. U.S. wind projects also raise the prospect of bringing good-paying jobs and economic development to communities that need a boost after declines in their manufacturing base. As a manufacturer of premium cable accessories for offshore wind and other marine-energy projects, PMI is doing its part to support the industry and help reduce our reliance on fossil fuels. We believe the United States is ready for offshore wind, and judging from the volume of new projects in the pipeline, we’re not alone in that assessment.